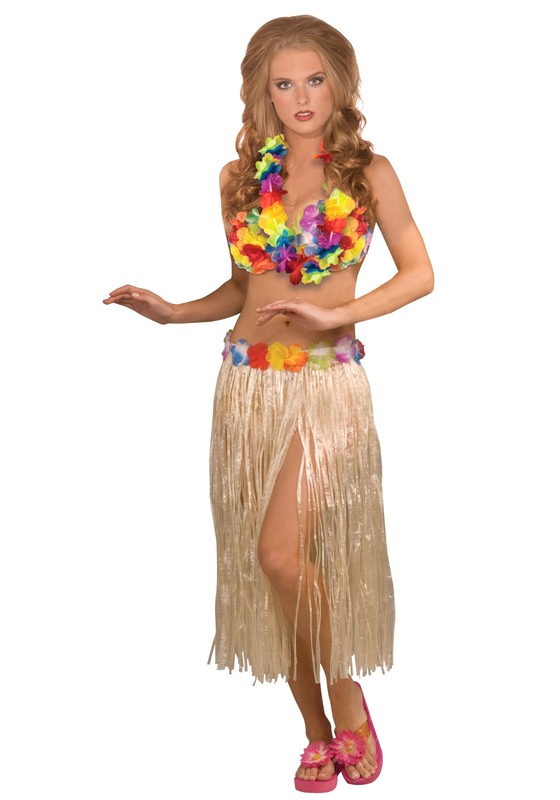 There's nothing like a grass skirt that inspires a graceful sense of rhythm. While we all don't have access to dancing on the beach under the Hawaiian stars, we all have a little hula inside of us somewhere. All we need to let it loose is the right outfit and a playlist with of top-fifty Ukelele hits. The trick to really pulling off some great island moves. Coordinating your hand movements with the swaying of your grass skirt. Once you've got that covered you'll be ready to take on any luau whether it's the middle of winter or you're enjoying your very own piece of tropical paradise. This three piece set has all the color you could ask for! This costume includes a red, blue, and lime green flowered bra top and a lei. The skirt comes to your ankles with a grass-like texture with colorful flowers around the hip. Pair this with some flowers in your hair and a colorful pair of flip flops to make your entrance as festive as possible. Keep Calm and Hula On! We're not going to go as far to show you some sweet hula moves (that might get uncomfortable for everyone) we would encourage you to break out this ensemble as often as possible! Show off your true colors at a backyard shindig and you won't want to wait to wear it again! Whether you're wearing it poolside or as a brighter take on a Halloween costume, you'll be sure to enjoy your new, tropical personality. So stomp those feet and throw on your lei. Everyone knows that grass is the new black!